Observatorielunden is one of my favorite parks in Stockholm. 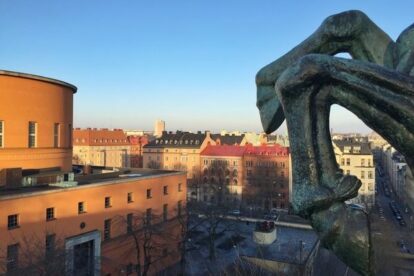 Set on a hill overlooking the monumental Stadsbiblioteket, the city library, there’s a great view of the city from this vantage point. Stockholm’s first astronomical observatory was erected here in the mid 18th Century and the daily weather observations recorded belong to one of the world’s oldest unbroken measurement series. I find this a great place to enjoy a summer picnic in the middle of the city. Sitting on one of the benches or on the grass with a bottle of wine and some take-away can easily make up a great lunch on a clear day. There’s also a nice little café by the old observatory building that will serve some tasty Swedish waffles and is open from mid-March. During winter, a walk up the hill will still grant you one of the best bird’s eye views of neighborhood Vasastan.